You can’t make art with them. And we all need our heads examined for thinking we could in the first place. I should be a bit more specific when I say, “art”. I mean the thinking man’s stuff. The kind of image that provokes your mind to complex, intense thought and feeling. I don’t mean “beauty” and that sort of nice to look at thing, but rather images that portray ideas and a fresh perspective on the world around us. 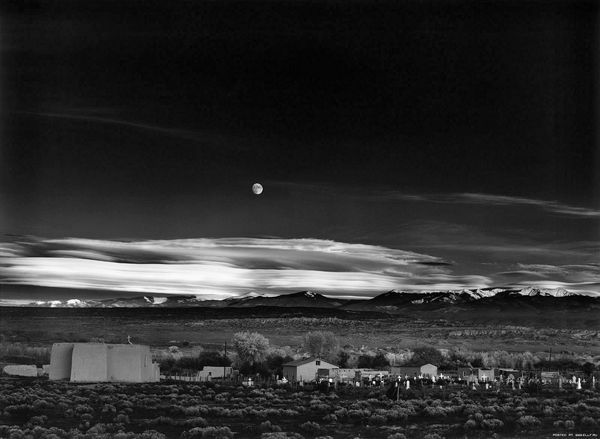 One of the best examples I can think of to illustrate what art is (no pun intended) is a photograph by Ansel Adams. It’s particularly appropriate with respect to fractal art because fractal art, to some degree, is like photography in that we “capture” imagery rather than form it ourselves. Art is like a new kind of food. The best way to describe it is to taste it. I can’t believe those clouds weren’t painted by Salvadore Dali. It’s just a photograph. But what a photograph. This is what I mean by art. You can’t make stuff like this with fractals. In this photo we see everything from the momentary (the little village) to the eternal (the moon). I think that’s how this image works in our minds but I’m guessing. There’s a story here, a poem, written in the oldest of visual languages: landscape. Fractals don’t tell stories because they don’t speak any of the visual languages, that being: the human form and gesture, or; landscape. Fractals, as many have pointed out, are mostly abstract imagery or in some cases, as with 3D fractals like the Mandelbox, geometric or organic-looking objects and scenes. None of these are capable of containing real world symbolism because they’re neither real nor capable of being altered and transformed into realistic things. It’s hard enough to be expressive with abstract painting, it’s much more difficult when one is also limited to using just geometric/organic structures and elements. Fractals are just too fractal. And with respect to art, they lie in the category of “decorative arts” or what is more currently called design and applied arts. But as decorative/design works, fractals work quite well because they often create interesting shapes with repeating elements that are easily rendered in multiple and selective ways. Fractals have an inherent tendency to create symmetrical, highly structured and in particular: organized imagery. It won’t ever compete with Picasso, but fractals do complement the fields of design and decorative arts. Fractal “art” is really just fractal “design” but these days the word “art” is applied in a broad way to any kind of visual imagery regardless of its status or merit. To say that fractals are limited to creating design work rather than art -work is not as insulting as it may sound. Bauhaus, Art Nouveau and Art-Deco, to name just a few 20th century examples of design and decoration all share the same category and have considerable popularity and respect within the art world. It wouldn’t be such a bad idea to compare the “fractal arts” with those of the famous design art movements of the 20th century. Bauhaus had a lot to do with beautiful kitchenware and innovative architectural styles, something that today’s high brow fractal artist may not want to be associated with, but that’s where I think “fractal design” fits. It’s an applied art form, a type of mathematical design: decorative, ornate and beautifying; but not really capable of depicting the kind of mentally stimulating content that has sometimes been created exclusively within the domain of the traditional art mediums (painting, drawing, sculpture..). Here’s another good example of what fractal art, ironically, can and can’t do. Can you imagine a fractal art image like this? Well, the shapes and designs in the image look very fractal like indeed, so in that respect I guess I’d have to say I’m wrong about all this. But the picture is all about the “skirt”. Fractals don’t make “skirts”, they make abstract/organic shapes. 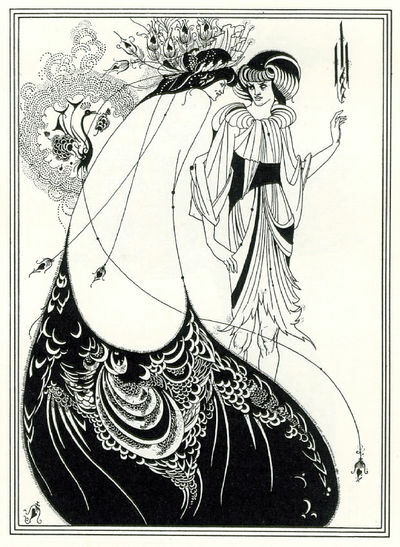 And the skirt forms an extension of the woman’s form contrasted with another woman’s form which together are depicting some very meaningful scene from Oscar Wilde’s play Salome (according to the Wikipedia where I got this). Once again we bump into that persistent language rich in symbol and story, that being the human form. How can you create such an artwork in the abstract? And not just the abstract, although that’s hard enough, how about with fractal –exclusively geometric– imagery? You see what I mean? 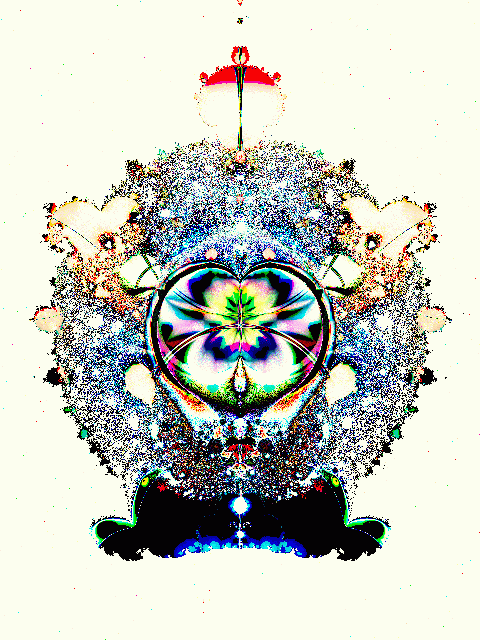 Fractal imagery just doesn’t do the sort of things that the traditional art mediums do. It can’t. But it can produce rich, in fact, even richer designs and ornate imagery than the human mind can. 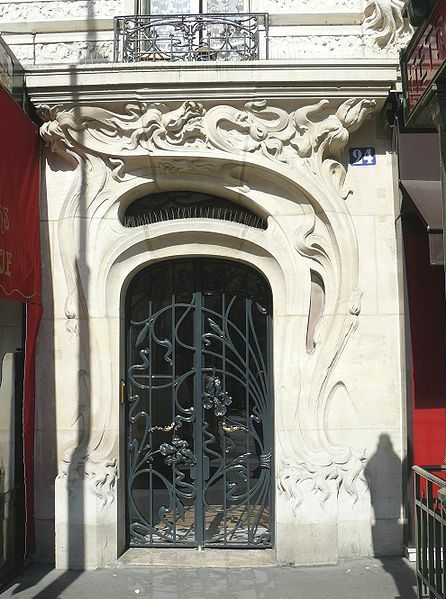 Again, this Art Nouveau example is more like what fractal art looks like than the Mona Lisa or a Salvadore Dali painting. Fractals belong in the design arts category and it’s nothing to be ashamed of. It’s not second-rate art, it’s just a simpler, more basic form of graphical works. Anyway, it doesn’t really matter what I think, it’s the truth. Fractals are design works; decorative works. Pawning them off as a rich, expressive medium is just delusion. And when the practitioners of fractal design pawn themselves off as artists it’s self-delusion. Accept yourself as you are and just concentrate on creating good work; work worth looking at. The pompous “fractals as art” posture is just a distraction and presents fractals in a context in which they fail to impress. It’s pretentious. I made this as an example of the design potential and decorative characteristics of fractals. There is nothing terribly expressive or thought provoking about this image; it’s just a nice collection of shapes, textures and coloring and it was so quick and easy to make because it’s the kind of thing fractals are good at doing. It comes natural to fractals. This is what fractal art is and this is all fractal art is ever going to be because fractal imagery just doesn’t possess the realistic or symbolic elements that traditional art mediums can. Even competing with abstract art is a bit of a stretch for fractals. But when we present fractals as just plain fractals, they results are much more pleasing and natural..
There’s a few other aspects of fractal art that keep it out of the “serious art” category: such as they’re way too easy to make. This is much more insidious than you might think. After all, what’s wrong with an art form that isn’t hard? Wouldn’t it mean there’s much more of it and it will soon become a rich and thriving genre? But what it means for fractals is that any new innovation in rendering or formulas soon becomes common place and cheap –everybody’s making it. The result is that there’s a thousand examples of everything. This has got to have some impression on outsiders who may at first marvel at the rich detail and slick forms in fractal art until they see how normal and simply average they are. In fractal art everything soon becomes cliche. Unless of course one can get creative with it. But here again fractals have a limitation that traditional, hand-made mediums don’t: fractals are made by remote control; hands-off rather than hands-on. Of course, photography is like that too, but photography has the richly expressive world of real life to draw on and that makes all the difference. With fractals, it’s just fractals. I really like the Indra Pearls series by Ultra Fractal artist Jos Leys. They have real style even though they appear to be rigidly mathematical and simply rendered. The simple rendering and bright colors enhance the appealing mathematical design and don’t distract from it; each complements the other. But I seriously wonder how much they’d be admired if they were as common as today’s mandelboxes, which were just as impressive when they first appeared. Jos’ work stands out because it stands alone. Action Painting, is a type of abstract expressionism that was based on quick execution. It often met with a similar quick execution from its audience. One of the main reasons was because it was, apparently, so quickly and easily made. Jackson Pollock’s drip paintings met with similar criticism. But unlike fractals, these artworks were deliberate constructions and expressions of the artist’s mind and the Action Painter could render almost anything a regular painter could and wasn’t constrained to the shapes and forms drawn by a fractal algorithm. Fractals are not products of the human mind and so they lack such human expression. It is, however, possible to manipulate (by hand) fractal imagery via layering or other graphical techniques; Ultra Fractal is well known for these kind of enhancing features. But you can’t draw with fractals, just enhance them. The creative scope gained from such features doesn’t make up for the limitations that fractal imagery already imposes. Confined to using a “palette of fractals” or “toolbox of fractals”, any artist is limited to producing works of design and decoration; the kind of imagery that is composed entirely from shapes, colors and patterns –fractal-like things. But it’s really just a type of regular photography where simple shapes and weird close-ups are the preferred subjects. 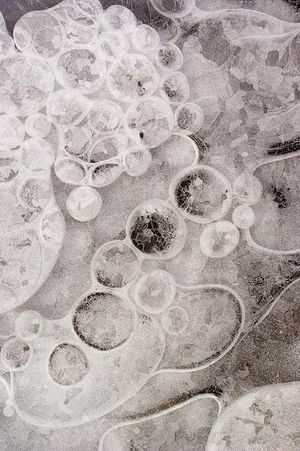 It’s stuff that features the simple, almost geometric beauty of things like frost crystals and satellite photos. We can make some pretty wonderful things with fractals. A lot of the newer software like Ultra Fractal allows for greater complexity of fractal compositions beyond the simple, single-layer screen-saves. But none of that has done anything to change the perennial problem in fractal art which is that fractals have such limited expressive potential that they are unable to create works that rise any higher than that of the decorative art and graphical design categories. Using fractal software to create the more serious types of art work, the kind of works that have defined the apex of art –portraying challenging ideas and big time intellectual things like zeitgeist– is simply impossible and out of reach for fractal artists no matter how high they try to leap and jump. You just can’t make serious art with fractals. Once you saw and understood the inevitable logic of it, the emotion is gone and only the process remain. If you can’t see the process, you’re just sitting in front of a random still image. Thanks for the laugh! I almost spit coffee onto my keyboard. Oh, you were *serious*? Really? Clearly, I disagree with you (I have gone so far as to have the word “art” in my website domain). My view of art is apparently much wider than yours, so it can easily include fractal and other types of generative art. Beyond that, I simply don’t understand how you can claim to know the “truth” about what is and what is not art–something that has been argued for as long as there has been imagery. See, I don’t know where you get the authority to conclusively label things as ‘art’ and ‘not art’, I know from experience that every single person I talk to about these definitions has a different idea and there’s no universally agreed definition as of yet. I’ll take this out of the context of fractals because what you’re discussing has become an overarching discussion on what we define as art. In the beginning, you say it’s what provokes thought, so it’s really a personal definition of whether any individual imagery provokes any thought in the individual, so you can’t really categorize things as ‘art’ or ‘not art’. Then you say that the visual language that we’re all used to from reality, which conclusively excludes all abstract art in sculptures, paintings, photography and digital art alike (I would like to go into instrumental music here but for the sake of keeping this in the visual medium i’ll only mention it within these parentheses). 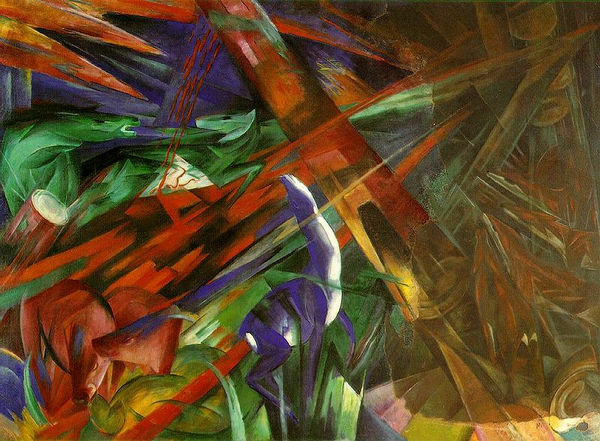 That also alludes to a notion that abstract imagery cannot evoke any thought or emotion in humans, an idea I find most disturbing, simply because some of my favorite artists are abstract expressionists and I can personally attest to actually having thoughts and feelings triggered by the abstract imagery in their art. This is also why I don’t see abstract photography can qualify but ‘fractal photography’ cannot. Just because you are not capable of projecting meaning onto shapes you’ve never seen in real life does not make that so for other people. And coming back to fractals, the fractal toolbox is not as limited as you think it is. I can see how it might feel that way to someone who hasn’t devoted the time to use all the tools the programs provide (I for one don’t/can’t use all the features fully), and I can also see how that might lead you to think it’s not a hands-on process, but I know a few fractal “artists” who are comfortable enough with the software as a painter is with their brush, or otherwise as a photographer is with their camera (they’re two different things, and there are fractal artists that use their software in either way). When one uses the program that way, it stops being a point-and-shoot camera, and the products stop being your standard landscape photos from the hands of any old tourist. … I really should proofread more. The definition of art is one of the most contentious of subjects so full marks for bravery. As to fractal art I use Ultra Fractal but doubt if I’m often considered a fractal artist. Indeed, I’m most often unsure what an artist is. The title is too easily given and overly ostentatious. It becomes quite common for some well known folk in the art world (artists?) to say of something “it is art because I say it is.” Well, artists produce art so that could have sustenance, but who says the individual is an artist. Lose that accolade and the argument falls short. I do argue with your previous article that the art in fractals is in the doing and not in the conclusion. The contention if taken into the world of oils, watercolours and the like suggests there is no art existent from the past – even if it came into being just yesterday. I do go along with you that for the “artist,” the creative process involves total involvement. I call this the subjective stage as you struggle to achieve a unity of rightness which enables the work to stand on its own two feet and fitted for contemplation by others. The “artist” won’t obtain a balanced view of a completed work until he distances himself into an objective viewpoint, but that acuteness of vision should grow over time and possibly in proportion to the degree of effort made to learn from the past. Frankly I gain most pleasure and understanding from the tussling which takes place within the creative process but there is always a point where finality is reached and this is at the decision of the artist concerned. Whether the image is then taken to a better finality might depend on its prospective use, – whether it is to be printed, framed and readied for the grim eyes of selectors or subjected to the sharp vision of a prospective purchaser. I do feel strongly that the appearance of an image on a screen monitor is no substitute for a printing of the image to a considered size. If nothing else a print avoids the variability of monitor size, colour imbalances etc. Sadly few fractals (or computer art generally) are made available for wide attention in this form. I’m fairly certain that you or Terry have expressed a liking for Paul DeCelle’s work. I too find his control of fractal software exceptional and it is exquisitely expressed in his ability to exactly copy the work of the Finnish artist, Lars-Gunnar Nordstrom. A comparison of the UF image with the original is enough to show conclusively that the medium has a beautifully individualistic capability in the right hands. That “picture” has twelve layers (signature apart) and the function of each layer is easily identifiable (I could have used fewer layers but chose the more complex route of separately edging the white and black inner squares rather than by overlapping). The picture attempts the expression of ideas by contrasting similarity of shape with colour differences and so begins with a clarity of purpose which is symptomatic of forethought. The computer and UF made the project easier – nothing more, and that is the now long, established utility of such machines in the commercial and scientific worlds, and we hope increasingly in the hands of artists. Well no wonder you don’t think fractals (or at least the ones that interest you) can be art! It almost seems like you’ve made the definitions mutually exclusive on purpose. By itself, it’s not a problem that “fractals you are interested in” and “images you deem art” do not overlap at all. Where you err is in implying that your definition of art is The Right One, and that all people will have the same reactions to the same fractals. Just because purely abstract, geometric imagery does not provoke emotions or suggest symbolism to you does not mean that it doesn’t do that for anyone else.